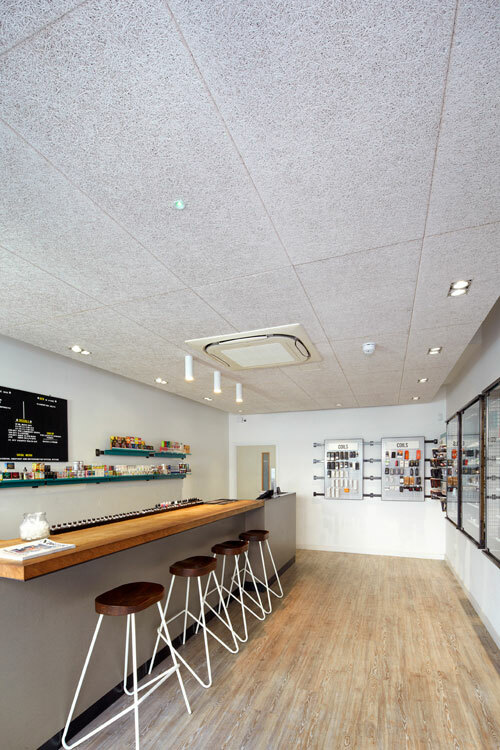 The Vape Superstore in London E8 has been shortlisted for an International Interior Design Award. This flagship store is the first of a chain of retail outlets primarily located in the capital. Designed by Catherine White Interiors, the contemporary environment creates a welcoming ambience for customers. 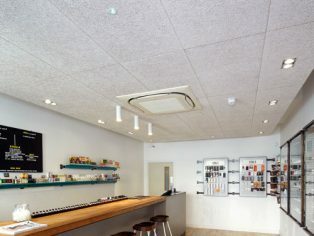 Heradesign from Knauf AMF is installed as a large ceiling raft to enhance the modern interior and offer outstanding acoustic control. Heradesign is a popular choice for architects and interior designers who want to produce a less processed, simpler aesthetic. Research shows that connection to the natural environment is shown to improve overall wellbeing. Heradesign is manufactured from sustainable wood-wool sourced from PEFC and FSC certified forests. Its naturally textured surface offers a comfortable feeling helping occupants feel in touch with nature. Natural materials also offer high performance characteristics that contribute to the comfort of a building. To help create a relaxed atmosphere for their customers, acoustic control was a necessity for the Superstore. Heradesign has the highest rating for sound absorption and sound insulation to help protect customers from unwanted traffic noise. In keeping with the clean aesthetic for the Vape Superstore, Heradesign was specified in white. But Heradesign can be produced in any colour to create a myriad of looks and interior themes, enabling true creative freedom. Hung as a large ceiling raft, the individual Heradesign planks are fitted together using a concealed grid to give an almost monolithic appearance. Ceiling services easily integrate with the raft. Heradesign offers a number of hanging options: fitted as a suspended ceiling, hung as rafts or baffles, or directly onto walls or ceilings. Heradesign is manufactured to be long-lasting and has a 15-year guarantee. When the time comes, it can be recycled or disposed of without any detrimental impact on the environment.